The Crystal Lurker Mouse is a breed of mouse found in the Fungal Cavern. A mouse consisting of a pure, hardened crystalline structure, he is highly unstable and insatiably hungry for gemstones. It's supernova core immediately heats up the consumed materials to repair, extend and expand its body. The immense heat and pressure inside the chest cavity of this mouse super-heats the air around it, causing small bits of rock to float within the cloud of hot air surrounding the mouse. The Crystal Lurker Mouse can only be attracted by using Gemstone Cheese, and to a lesser extent, Mineral Cheese. The Crystal Lurker Mouse is susceptible to Forgotten weapons. The Crystal Lurker Mouse drops the Cave Gemstone Egg during the annual Spring Egg Hunt. 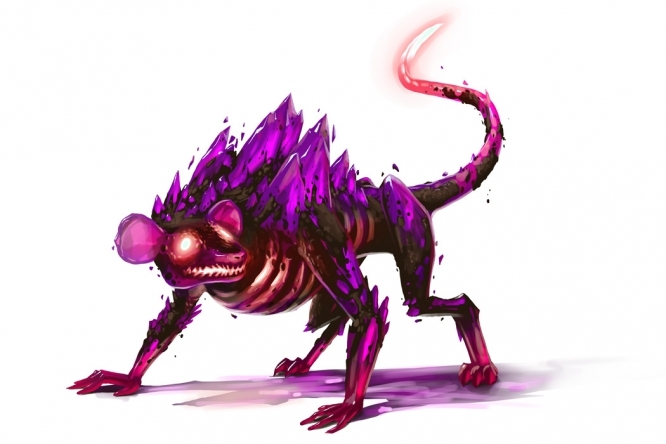 12 May 2015: The Crystal Lurker Mouse was released as part of the Fungal Cavern content. 9 September 2015: The Crystal Lurker Mouse moved from Sandtail Desert with the relocation of Fungal Cavern to the Hollow Heights region with its release. This page was last edited on 27 May 2017, at 01:35.